Surprisingly, four airlines make the list. 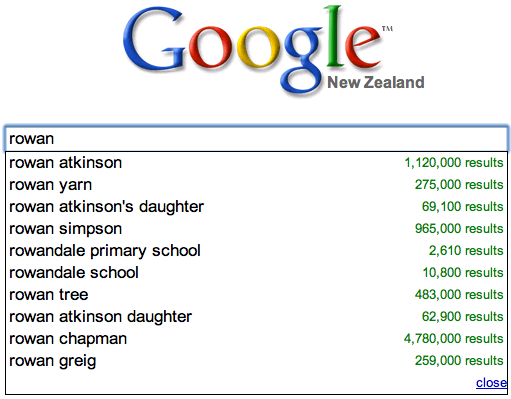 But only one bank, Kiwibank, although all of the others were in the top few results. Lots of online gaming sites make the list, including runescape and miniclip, as well as the generic “online games” – club penguin and mathletics also featured in the top results for their letters. Some local sites beat out well known international competition – e.g. “ird” over “itunes”, “air nz” over “amazon” and “white pages” over “wikipedia”. What do you make of this list? Any obvious omissions? How many letters do you have to type into Google Suggest before your site shows up? I’m in fourth place, behind Rowan Atkinson and his daughter. What’s also interesting is how these change over time based on demand changes (seasonal or event driven). I’m way down in the results for my name (I get all the way to “kirk j” before it shows me :). What I make from that list is that even though having a good name is important, having a good first letter is also important! If you’re building an auction site, starting your site name with “trade” will help you show up in people’s faces. Conversely, maybe you could pick a less common first letter — maybe you think you can knock Currency Coverter or University of Auckland off the top spot, but would never be able to beat Xtra. Also make sure you are not signed into a Google account when you use the “suggest” or your search history will skew and pollute the results. Well “pollute” if you search for a lot of smutty crap. I appear to be the 8th most important Vaughan. You have to type my whole first name and the first three letters of my surname before you get me. But at least the first two search results are actually *me* now, not some random woman who married an American sports star. Who are these people who search for radio stations? I have to type 3 letters before I turn up at #9. Bloody Hell! Zefrank beat me to it again. He’s #1.